CrimeScore is a new local open data API by YourMapper that gives you a detailed safety grade at your current location. CrimeScore rating uses a propriety methodology based on address-level open data crime reports, weighted for type of crime, recency, and proximity, then adjusted by neighboring CrimeScore ratings, and finally statistically standardized across a bell curve based on all the CrimeScores across a city, updated daily. Our nationwide crime rating for your location is available in the following cities, with more being added soon. 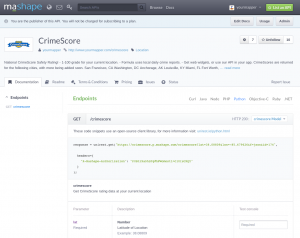 Directly access the CrimeScore API, with dynamic documentation and in-browser testing on Mashape. Also, check out our GitHub repository for a server-side example using Mashape, and full code for an interactive online browser map. We have a variety of badges (download) you can use on your website or app that are color coded to show grades, and only require you to overlay the grade or score that we return for a location. CrimeScore is a GPS enabled Pebble app that calculates a composite score based on the amount of crime in your immediate area. We’ve submitted it to Pebble’s online app challenge through ChallengePost. If you have a moment, head over there and vote or leave a comment! 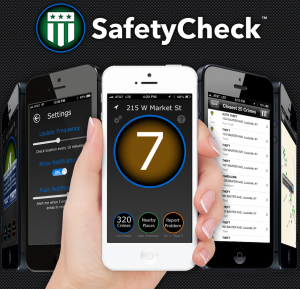 SafetyCheck is a mobile iphone app that gives you a CrimeScore rating at your current location. The app shows a rating from 1 to 10 of your current safety level, and the number of recent crimes in your area. It uses the API to keep all the data processing server-side. 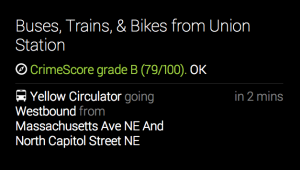 AskOpenData.com has integrated the CrimeScore API into his Washington DC Google Glass transit directions app called Ask Metro. It lets you know the crime rating of the station you are headed to. Get starting adding a CrimeScore rating to your existing services, adding value and information for your new and existing clients. Or come up with your own app or service based on ideas we haven’t even thought of yet!